Be Broke But Happy: Giveaway: Autographed Book, "A Girl and Her Money"
Giveaway: Autographed Book, "A Girl and Her Money"
THIS GIVEAWAY HAS EXPIRED effective midnight, February 2, 2009. Check back for new giveaways at a later date. This blog's very first free giveaways are contributed by Sharon Durling, author of A Girl and Her Money: How to Have a Great Relationship Without Falling in Love, published by Thomas Nelson. TWO WINNERS! The book will be personally autographed, per your request, to you or anyone of your choosing. Does that row of numbers in your checkbook register make you nauseated? 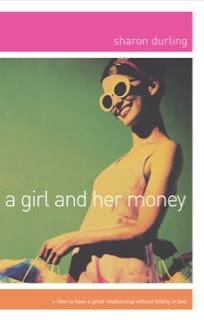 "A Girl and Her Money" is for women like us, by financial expert and veteran shopper Sharon Durling who, like a best friend, shares empathy and an encouraging, liberating message: You deserve a happy, healthy and fulfilling relationship with money! TWO winners will be randomly selected from all entrants. You may enter any of the following ways, up to three entries. Don't forget to leave your email or make available in your profile so we can contact you. You may post anti-spam, like bebrokebuthappy (at) gmail (dot) com. Winners must respond in three days upon notification or new winners will be selected. Giveaway ends midnight CST, Monday Feb 2; winners announced Tuesday, Feb 3. Open to residents of US and Canada. Check out other contests at Bloggy Giveaways. Christina - xristya@rock.com - I would certainly love to learn all the above-mentioned aspects of this book! this looks like a great book for me. Sounds lovely Thanks for entering me. I need more money and THEN a way to handle it! Thanks for the giveaway. I would read this book over and over again! Well, probably I need to read this...Thanks! Wow count me in !! I love it!! I would love to know my Money personality! I follow almost all of your suggestions except the one about hanging clothes instead of using the dryer. I must get with it and get out of the use of using a dryer. Also, I subscribed through my yahoo. You're funny too but frugal. I'd love to read it but have never seen it! That looks like one awesome book, thanks for the giveaway! just subscribed, fun blog title! Sounds like a book that I could use. I love getting money tips from the experts. Sometimes there are really simple things you can do that make a world of difference. Sounds like a very useful book. I hope I win! O, I believe everyone needs this book. Be broke and happy. This sounds like an interesting book. Everyone is interested in the topic! LOL! Thanks! I subscribed via a reader - My AOL. haha - i need to know how to make peace with money. :) we definitely have an ongoing love/hate relationship. I'd like to read this interesting book. Thanks. I'd love this book. Sounds very enlightening. A Girl and Her Money sounds like just the book I need. Thanks.